Mules Ears bloom in July, right? Well, it's the first day of June. 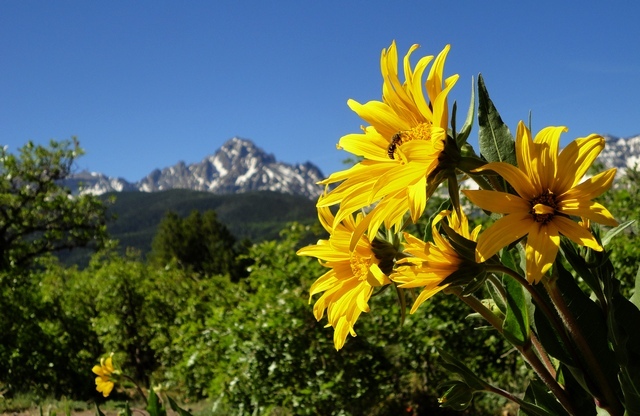 Those are real mules ears flowers (note the bee) with Mt. Sneffels in the background. Gary Garren and I did quite the grand tour today, covering three roads here in Ouray County, Colorado. 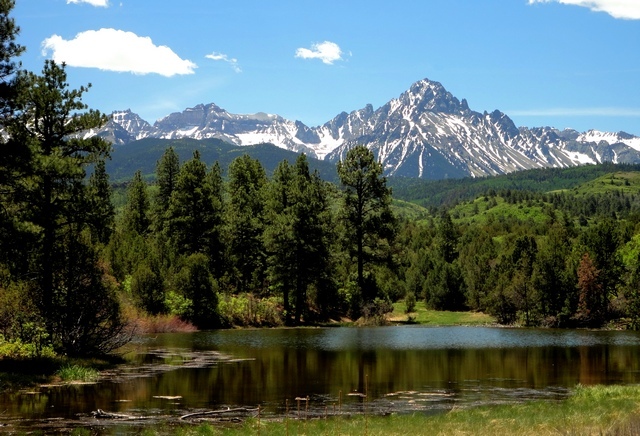 County Roads 5, 7, and 9 have in common that they end right at the very feet of the Sneffels Range with beautiful views. This was Gary’s first ride with his new (to him) Kawasaki 250cc dirt bike. We started with CR 5, which takes off from right in Ridgway. It’s fairly standard gravel road for several miles until where the interesting part starts (see map), which is the part that’s not maintained in winter. It winds through some truly beautiful country and has stunning views of Mt. Sneffels and the eastern half of the Sneffels Range. CR 5 alternately winds through trees and through open meadow. This is a great place for fall color. Gary on his Kawasaki dirt bike with Mt. Sneffels in the background. Today was its coming-out party. CR 7 (see GPS track below) takes off south from Colorado Highway 62 a few miles west of Ridgway, right where the highway crosses Dallas Creek. The first several miles are ordinary gravel road, but the higher you go, the more spectacular the views. The first view encountered is a lovely lake, shown below. Please note that this lake is on private property and should be photographed from the road. Pond with a view! This is found along Ouray CR 7. 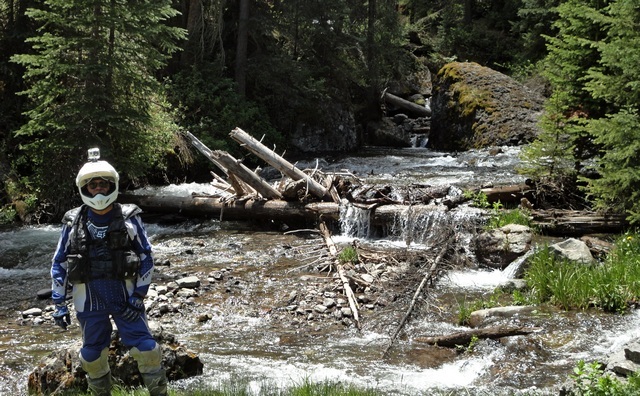 Gary took this picture of me next to the river along the Dallas Trail only about a quarter mile from the trailhead. Note my new GoPro HD Hero2 helmet camera atop my helmet! We finished with a trip up Ouray CR 9, which transits Ralph Lauren’s beautiful cattle ranch. The views along this road are beautiful everywhere. The final creek just before getting to Box Factory Park is amazingly fordable—last year I didn’t even attempt it until August—this year it’s a pussycat. We admired the views for a bit and then headed back down the hill. This view comes after only about a mile of road south of CO Hwy 62. That's Mt. Sneffels on the right. 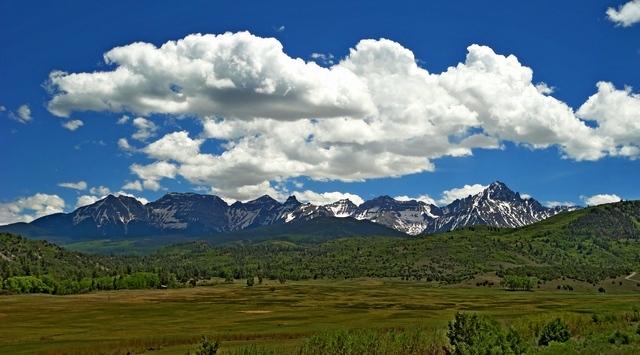 The view encompasses the eastern half of the Sneffels Range. Last but not least, here is the GPS track for all three roads, taken today. 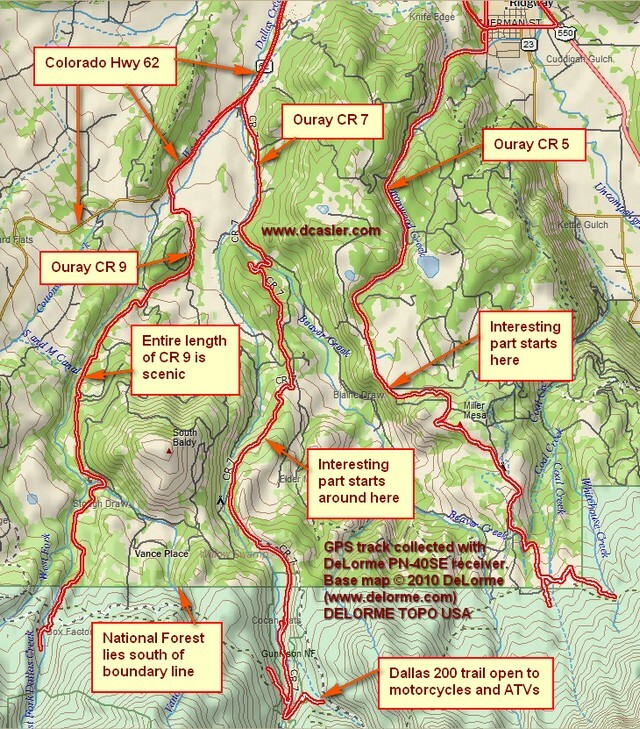 GPS track for Ouray, Colorado, County Roads 5, 7, and 9. 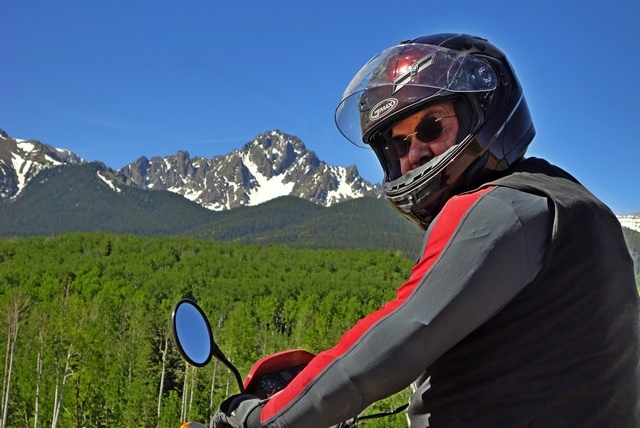 This entry was posted in GPS Tracks, Motorcycling, Ouray County, Wildflowers and tagged Mt. Sneffels. Bookmark the permalink.